Don’t wait until the final stages of the design process to perform modeling and simulation. Try these four ways to make more informed decisions sooner using simulation models. Early product design decisions by engineers are often done in a vacuum of information. Starting with an initial concept and testing as you go is a great way to collect data about what’s working and what isn’t that will ultimately get you to a better outcome. Learn four ways every engineer should use simulation models during design to test ideas and make informed decisions. You don’t have to wait until the final stages of the design process to perform modeling and simulation. Here are four types of simulations all engineers can use to inform designs from the earliest stages until a physical product is created. Linear static stress simulation evaluates the strength of parts based on how they will be loaded and constrained in use. Modal analysis simulations examine how a part performs when it undergoes vibration. Thermal analysis and CFD simulations gauge heat distribution through a model and fluid flow in and around objects. Fatigue simulation provides useful information on the maximum stress, strain, and deformations your parts will experience in use. A common misconception about simulation is that it takes a long time and is difficult to use. While engineering expertise is still required for effective application of simulation models, user experiences for many simulation tools has been improved. 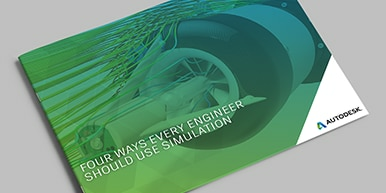 Streamlined and user-friendly simulation tools allow engineers to perform many more tests throughout the development process with minimal disruption to the flow of design. Download the eBook to learn how four ways simulation models can help you make informed design decisions.